Google: Google might be the biggest big data company of them all, and it used everything in its toolbox yesterday to create probably the most comprehensive tool available for tracking Sandy’s progress — its Superstorm Sandy Crisis Map. Not only does it collect, display and layer weather data from a number of sources, but it also includes video feeds from various locations, evacuation routes, emergency centers and traffic conditions (note: embedded map is interactive). 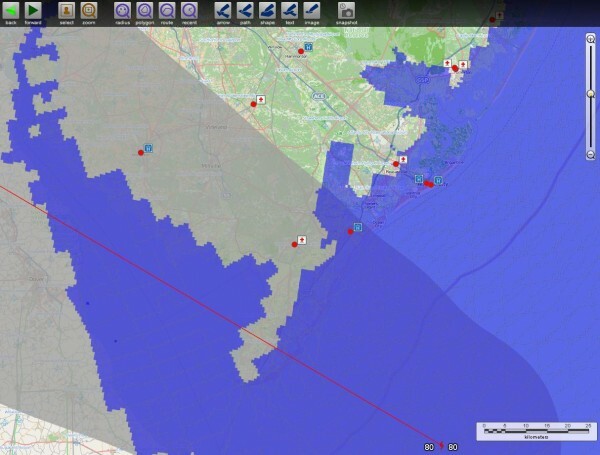 “Working with analytical and data visualization tools from technology partner, Palantir, Direct Relief is able to to pinpoint clinic partners located in socially vulnerable areas and in flood risk zones near Hurricane Sandy’s path. Palantir’s tools allow Direct Relief to pull together massive amounts of information sources into a common framework to better understand, visualize, plan, and manage for complex emergencies in near real-time. SiSense: SiSense is a business intelligence startup headquartered in Tel Aviv, Israel, that boasts one of the fastest in-memory data analysis platforms around. On Monday, the company showed off what its product, called Prism, can do with a little weather data. 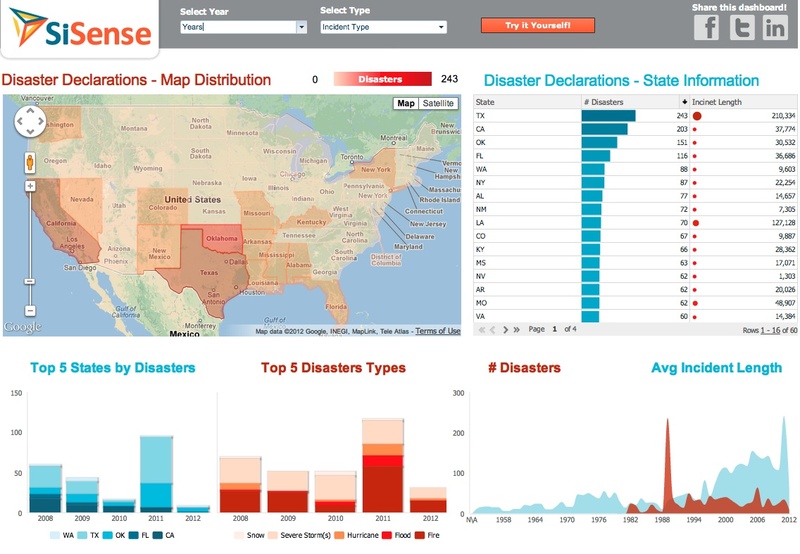 The resulting interactive dashboard — which the company claims took less than an hour to build and uses open data from Data.gov — won’t help anybody track Sandy’s progress, but could help companies looking to avoid natural disasters find the safest places to locate their companies or critical data center assets. Datum Companies: A Greenwich, Conn., company called Datum Companies on Friday (we’ll assume the timing isn’t entirely coincidental) launched its flagship catastrophe-prediction platform called Eurus. 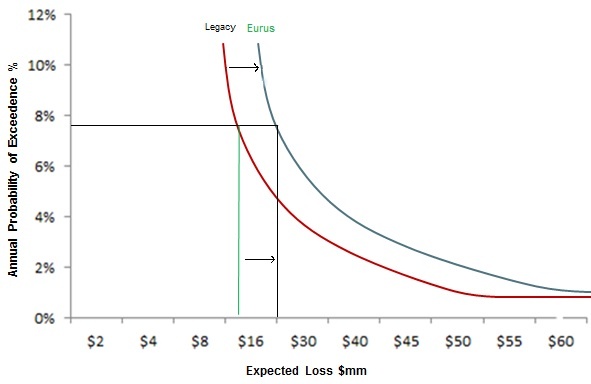 Designed for customers in the insurance industries, the cloud service uses a variety of advanced statistical methods, as well as machine learning algorithms, to predict the likelihood of and monetary losses associated with natural disasters. Built on the Cassandra NoSQL database, the platform stores and collects billions of data points that it uses to train its predictive models. Of course, parties interested in turning a profit aren’t the only ones whose data expertise proves effective in the case of natural disasters. We might also start paying more attention to the computer models from meteorology researchers, which proved remarkably accurate in predicting Sandy’s evolution from a coastal hurricane into an inland post-tropical storm. Assuming new, better satellites do actually launch later this decade to power future models, they might combine with next-generation commercial big data products and open data sets to provide some very useful data about how and when disasters will hit, how bad the effects might be, and how best to prepare. I hate you palantir. You are why this country is failing!